This battery terminal and lug kit contains 49 total pieces total. Inside are 6 different standard copper lugs, 6 different copper crimp terminals, 5 pieces each of side terminal power accessory and 2 pieces each of universal lead terminals. Replacing a corroded lug or terminal never seemed so easy! 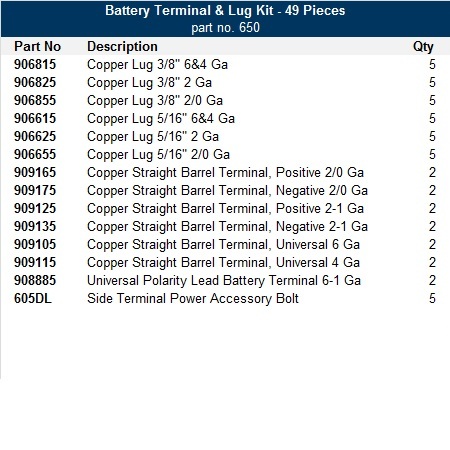 This kit contains 49 total pieces, including 5 pcs each of 6 different standard copper lugs 6 ga-2/O, 5 pcs each of side terminal power accessory, and 2 pcs each of universal lead and 6 different copper crimp terminals (8-4/O Ga). All contained within a rugged, gray metal scoop box (13-5/16" x 9-1/4" x 2"). For a detailed list of kit contents call 1-800-654-4757.